Summary: The creater of #engchat, Meenoo Rami, describes how #engchat began as a weekly online chat for English teachers and has grown into a platform that has thousands of followers and hundreds of weekly tweets and retweets. Read a little about #engchat here and then join the conversation on Twitter. This conversation took place around dinner time on January 10th. @AndersonGL was in Chicago, @feministteacher was in NYC and @mrchase was in Philadelphia. They are all educators and they are all engaged in a reflective dialogue about their practice. 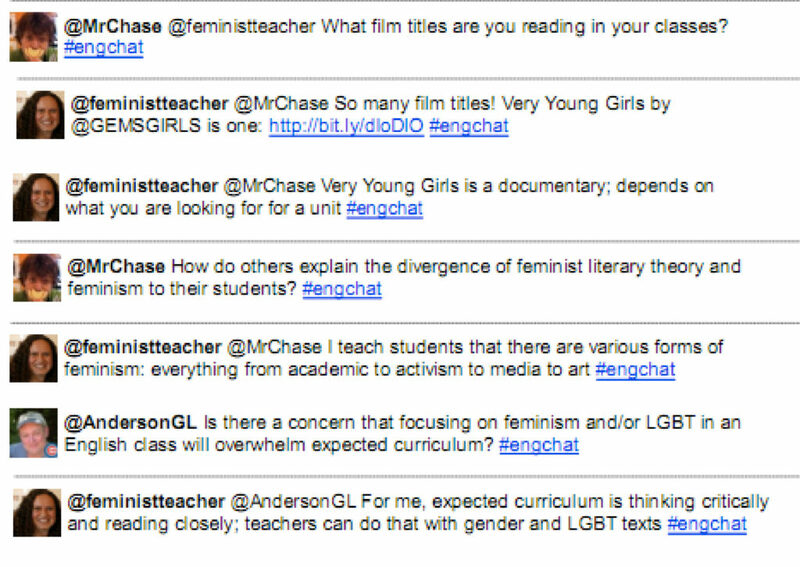 A weekly twitter chat, #engchat, actually allowed them to come together and have a conversation around the topic of using feminist and LGBT texts in high school English classes. It is difficult to say whether #engchat is providing valuable professional development experience to these self-motivated educators who choose to participate in the weekly conversations but there is a sense of community, collegiality and collaboration for the teachers. This sense of community extends beyond Monday nights and regular users of the #engchat hashtag post links, share resources, ask questions and receive feedback throughout the week from other English teachers on twitter. When I started #engchat in August 2010, I had no idea if it would even work. But I took the plunge and learned from participating in twitter chat such as #edchat and launched a twitter chat for English teachers. As a high school English teacher who has recently discovered the power of connectivity through social media, I was looking for a community of English teachers on twitter much like the English Companion Ning created by Jim Burke. While ECning provides the space to post questions and seek resources, I knew that the instantaneous feedback that you get from twitter colleagues had untapped power to provide support to new and experienced teachers. The evolution of #engchat has been incredible, since it began, more than 3500 users have sent out more than 10,000 tweets using this hashtag sharing more than 5000 links. It all started at New Teacher Camp in Philadelphia. Around this time, I had participated in twitter chat like #edchat and was starting to notice subject area chats starting up as well. The thought of creating a weekly twitter chat for English teachers excited me but I soon began to doubt myself. How would this work? Can I take on more one more initiative in my life right now? How can you even limit English teachers to 140 characters? Would this even be a meaningful experience for English teachers? These are just some of the questions that kept coming up for me. Maybe because I was in middle of my Summer Institute with National Writing Project through Philadelphia Writing Project and all the discourse of taking risks in our teaching practice and seeing yourself as teacher-leader gave me confidence and I decided to start a twitter chat, #engchat, for English teachers around the country. I settled on Monday nights at 7 PM EST as the designated weekly time to “meet” with other outstanding English teachers on twitter. I quickly realized that leading an engaging discussion every week would prove to be a challenge so I started reaching out to other English educators on twitter and see if they would agree to moderate the discussion as a guest and I would fill in the weeks where I couldn’t secure a moderator. This distribution of leadership for #engchat has made it a richer discussion for all involved. The first person who really embraced the idea of #engchat and aided its growth was Jim Burke. He quickly agreed to host #engchat even though he had never participated in such discussion via twitter before and he was willing to learn alongside other participants. Soon, others came on board and we’ve been incredibly lucky enough to have variety of guest moderators including: @SarahWessling from Iowa, @Writer (Penny Kittle) from New Hampshire, @hickstro (Troy Hicks) from Michigan, @AndreaZellner from Michigan, @poh (Paul Oh) from California, @cakeypal (Kathee Godfrey) from California and @feministteacher (Ileana Jimenez) from New York. These incredible moderators have elevated our collective thinking about our practice in the classroom, about the tools and strategies we choose to use with our students, and about larger societal forces and implications of our work with students. Those who can not always find time on Mondays at 7 PM EST to join #engchat, can find our archives here. Cindy Minnich, Capital Area Writing Project Teacher Consultant, has been an incredible partner in supporting my work with #engchat. She has archived our weekly discussions and maintained our wiki as well. The experience of starting #engchat in the current context of my school district where Twitter is actually blocked in our schools has been an interesting one. I have worked and lived in the dichotomy of benefiting from social media tools on the web but being limited in my use of them with my students. By helping create a community of English teachers on Twitter, I have done my small part to help teachers who are just now discovering the power of this medium. There are several questions that I continue to grapple with including: how do I share the value of #engchat with others who are not regular users of social media tools on the web? It is easy to say that we make connections through #engchat but what is important about those connections? Lastly, is #engchat encouraging deeper discussion and reflection outside of the one hour discussion amongst the users? When looking at before and after posts by guest moderators and participants, such as the one written by Brigid Reading following the discussion around including Feminist and LGBT texts in high school English classrooms shows personal connection and reflection on the part of the participants. I invite you to share your thoughts about role of twitter chats in lives of teachers and practitioners.